So, a bit ago I ran across a question on Superman's secret identity, where one of the answers reminded me of that ability known as super-hypnotism. If I recall correctly, the power was 'discovered' by Superman, as a kind of retroactive explanation for why people weren't connecting the dots between his identities, or even commenting on the obvious physical similarity. The question is, has there been any in-universe discussion of the ethics of that power? I remember being under the impression that the character himself treated it as an explanation, a reason why his disguise worked as well as it seemed to... instead of noticing or caring that he seemed to have no control over the power, no idea what it had been influencing, or how to stop it. All that ethical stuff. On the other hand, I'm only somewhat familiar with the source comics - perhaps I just missed that discussion, or it happened sometime later or in a different iteration. 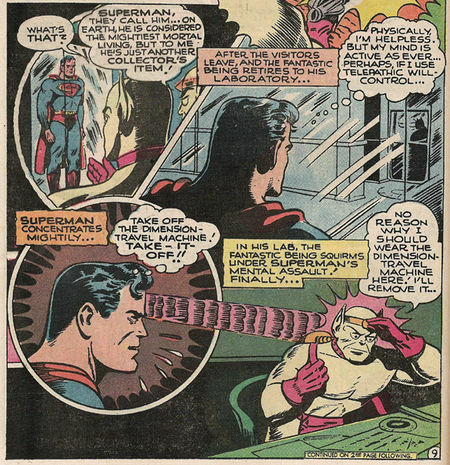 Superman's hypnotic abilities extended far beyond masking his identity. Rather than simply being an uncontrollable phenomenon, he generally did have control of his hypnotism abilities and most of the examples I've seen were explained as extensions of his superhuman willpower. I'm not aware of any ethical discussion surrounding his super hypnotism but because Superman's most powerful ability is likely his super morality, this isn't much of a surprise. The version of hypnosis responsible for hiding his dual identity may be unconscious but as an extension of his own will, it's subject to the same moral restraints that Superman regularly displays. It's also worth noting that it's specifically limited to projecting his desire to appear weaker and frailer than he really is and it wouldn't work unconsciously at all if it weren't for his glasses. I don't recall it being brought up in that issue; as you noted, it was news to Superman himself. And I don't think the power was ever brought up again. 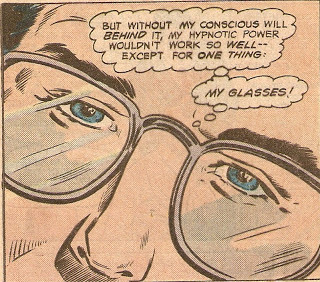 Out-of-universe, it was intended as a better solution for why no one realizes Clark and Superman look the same than "Clark wears glasses, and Superman has a spit-curl." In practice, after 40+ years, that (admittedly ludicrous) explanation had pretty much wriggled itself firmly into the "suspension of disbelief" thing, and it was an answer to a question no one really cared much about any more. And, in fact, quickly became relegated to the realm of trivia about weird, one-off Superman powers. No actual in-universe answer exists, then, to the best of my knowledge. Maybe, just like he hypnotized all of the WGBS TV viewers without realizing it, he hypnotized himself into forgetting it while staring in the mirror the next morning! Not the answer you're looking for? Browse other questions tagged dc superman supernatural-abilities morality or ask your own question. Does any science-fiction handle the ethics of teleportation (“kill and clone”)? Are there criteria for being a super hero and does Batman meet them? Is there a difference between Superman’s Gotham City and Batman’s? Is Oswin Oswald now super-human due to Trenzalore and the great intelligence? Is there a superhero who has notably super-strong teeth?